Last night I was fortunate enough to be invited along to a preview of West Yorkshire's newest craft beer bar, The Sparrow Bier Cafe in Bradford, which officially opens it's doors tomorrow (20th May 2011). The guys have been working like crazy to get the place ready in time for launch and I got the impression the workmen had left for the day not long before we were welcomed in - especially when my first pint stuck to the not-quite-dry varnish on the table! That said, the place was 99% finished and does look fantastic. As you can see there's a big glass front to the place which lets in loads of light and helps the bar feel spacious and airy (there will be more tables out than is pictured though), along with clusters of tables and chairs, giving it a real relaxed cafe atmosphere. The floors were still to be finished when we were there, but loads of local art was already up on the walls and there was a huge chalk board to the left of the bar where I'm assuming things such as specials are going to be listed. The soft green paint reminded me a lot of Veritas in Leeds, which isn't far off my impression of the bar overall, which was a bit like a cross between North bar and Veritas. Which is high praise indeed. Bernard Dark Lager (keg) - Rich yet refreshing with chocolate and light roasted malt, and a clean, dry, herbal hop finish. Really lovely stuff. Meantime Special (keg) - A pretty standard IPA, not quite as good as their India Pale Ale in bottles, but still pretty good. Meantime Stout (keg) - My favourite stout of the night. Super smokey, chocolate, dry coffee. Jaipur (cask) - Always a good choice, this was perfectly conditoned and tasted super fresh and hoppy, with all that grapefruit and tropical fruityness. A classic. Bernard Unfiltered (keg) - A great biscuity pilsner style unfiltered beer with an almost nutty savouriness and bags of spicy hops in the finish. Silly Saison (250ml bottle) - Lovely sweet Belgian richness, low on hops but big on herby flavour. A lovely 5% beer that is an absolute belter of a bargain at £2.20 a bottle. Plus it's on the regular beer menu so should always be available. Great Divide Titan IPA (330ml bottle) - This self proclaimed "Assertive India Pale Ale" was one of the bottled specials which will regularly change. It was an absolute stonker of a beer. I think everyone on our table bought a bottle and by the end of the night the fridge had been emptied of them. Huge, hoppy, sappy, pithy, delicious. Plus at £4 a bottle for a 7.1% American Hop Bomb, this was a steal. If they've got this in the fridge when you go then do yourself a favour and buy a bottle! 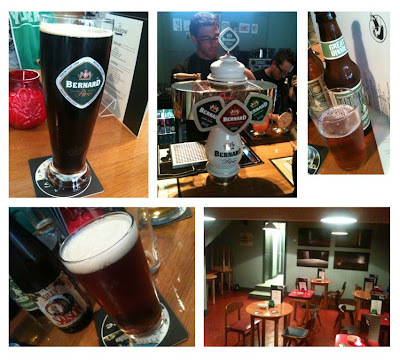 Here are some more photos that I took, which show the downstairs seating area, Bernard font, and a few of the beers I tried. Superb Bar, great beers, brilliant guys, Pub of the season and Pub of the Year all in 12 Months. Well done. Brighton Bill Bradford.